Brock Lesnar debuted in the Octagon at UFC 81, losing to Frank Mir in 90 seconds on Super Bowl weekend. The former NCAA and WWE champion lost a point for striking Mir in the back of the head before tapping out to a kneebar. 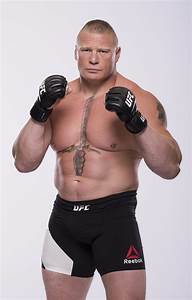 Lesnar’s debut drew 600,000 pay-per-view buys, and he would later capture the UFC heavyweight championship. This gave Lesnar even more credibility when he went back to the WWE. Antonio Rodrigo Noguiera captured the UFC interim heavyweight title by defeating Tim Sylvia with a guillotine choke in Round 3. Big Nog became the first man to hold heavyweight titles in PRIDE and UFC. The interim title was created because champion Randy Couture was in the middle of a long contract dispute with the UFC. The guillotine choke seemed to be everyone’s favorite move on this night. Nate Marquardt used it to beat Jeremy Horn in the second round. Ricardo Almeida also used the guillotine to wipe out Rob Yundt in 68 seconds. In the PPV opener, Tyson Griffin scored a unanimous decision over Gleison Tibau with three scores of 30-27. Chris Lytle lived up to his “Lights Out” nickname by knocking out Kyle Bradley in 33 second on the pre-show. In other preliminary bouts, Marvin Eastman beat Terry Martin by unanimous decision; Rob Emerson won a split decision over Keita Nakamura; and Tim “The Barbarian” Boetsch beat David Heath with eight seconds left in the first round.